Who are Generation Z and why are they important? There’s some debate on the exact dates, but Generation Z members are those born after the Millennials – roughly between the mid-1990s to 2010 – which makes them our current tweens, teens and young adults. This generation has grown up in an internet-connected world their entire lives and cannot remember a time before smartphones. They are permanently switched on, multi-tasking on multi-screens. They are technologically savy and possess great digital know-how. Because of their exposure to a worldwide web of information, they are skilled at accessing anything they need and getting quick results. While highly beneficial, there may be some downsides to this. GenZers are said to possess an eight-second attention span and as many as 11 percent have been diagnosed with ADHD. Another issue is that being constantly faced with seeing what others are doing online can create unrealistic ideals and cause self-esteem issues. One of the most important things that our teens need support with is their self-worth. On the other hand, their heavy exposure to information at their fingertips has also made them socially and technologically empowered. It has shaped their outlook and perspective to one of tolerance, acceptance and self-expression. This needs to be encouraged. Generation Z thrive on entrepreneurship and creativity. They’re entrepreneurial to the core, conscientious, problem-solving and hardworking. A 2014 study, Generation Z Goes to College, reports that Generation Z students identify as being loyal, compassionate, thoughtful, open-minded, responsible and determined. They like to work independently, prefer hands-on learning and, interestingly, want person-to-person contact despite their comfort with technology. They demand transparency and originality. Generation Z are our future. 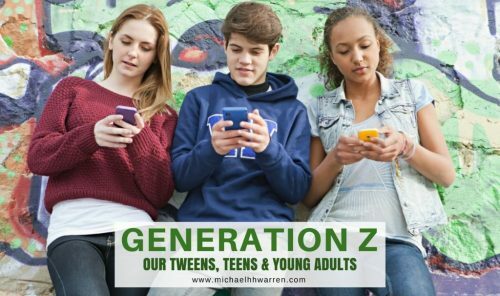 The important thing in dealing with Gen Z teens is to understand what motivates them, to give them opportunities to share their perspectives and concerns, to encourage them to grow in their self-worth and to provide them with loving support. I believe that they have the potential to change the world for the better — to steer us toward a more purposeful, sustainable future. Let’s help them get there.